From mixing to whipping liquids, these devices offer a lot of food preparation process. For example, one can chop herbs and spices to make salsa or you can knead dough to create pastries or bread. One can also grind meat to create sausages or patties. One can also use it to slice, mash or dice several food items as per their choice. Although, this type of mixer grinder offers several options when it involves different type of food processing, the fact of the matter it is still easy to operate. In fact, most of them come with several blades and other accessories that can do different processes. 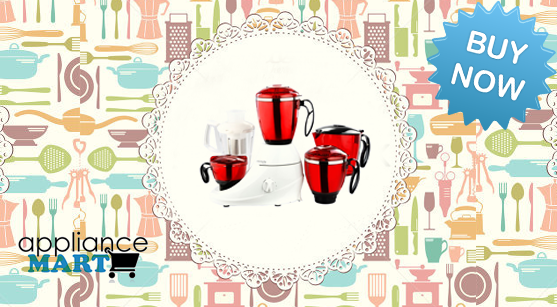 By owning them, you can make your life in the kitchen much easier when you are preparing your own cuisine. With technology making rapid strides, a lot of appliances have come into the market. The speed is an important criterion in the choice of a mixer grinder. This allows you a great control while mixing different ingredients. The overload function is another important criterion, which one has to pay attention, as well. Many times it is observed that we tend to put more material in the jar than what is suggested. This results in the motor getting overloaded and breaking down. Therefore, a special relay known as the circuit breaker is provided, which works like a common fuse in the house. Having such a feature can be useful from the safety as well as the maintenance point of view. One of the other features, which you could watch also, is the locking facility. This means that the machine does not start correctly until and unless the jar is locked currently on the mixer juicer grinder. This is an essential feature, which you need to consider when you have children in the house. The author is an online strategist and an analyst who has been associated from the Appliance Mart group.